Like a great looming shadow, so is Indiana Jones and the Temple of Doom. It's impossible to write a blog on Hindi movies without mentioning the film a kabillion times - if only because of its outrageously offensive Orientalism, and the fact that Amrish Puri is in it. Yesterday, after a full-on Harrison Ford bonanza of film-watching, which included much of the Star Wars sixology as well as the underwhelming What Lies Beneath, we watched Temple of Doom. It was like the "oogledy boogledy!" icing on a crazy cake. The last time we had seen it, we were young, impressionable Harrison Ford worshipers who didn't worry about things like Orientalism and just focused on how glistening his biceps were. Now, older and wiser, we can say: his biceps are so shiny! And his chest...! Ooh, la la. Many apologies. This is a SERIOUS review about a SERIOUS problem: the wrongness of Temple of Doom. Because, as one of our viewing companions noted, if the government won't let you film in their country because your story is too racist and your top-choice screenwriter refuses to work on it because he finds it "ugly and mean-spirited", maybe it's time to rethink the story? Apparently not, Spielberg and Lucas decided. 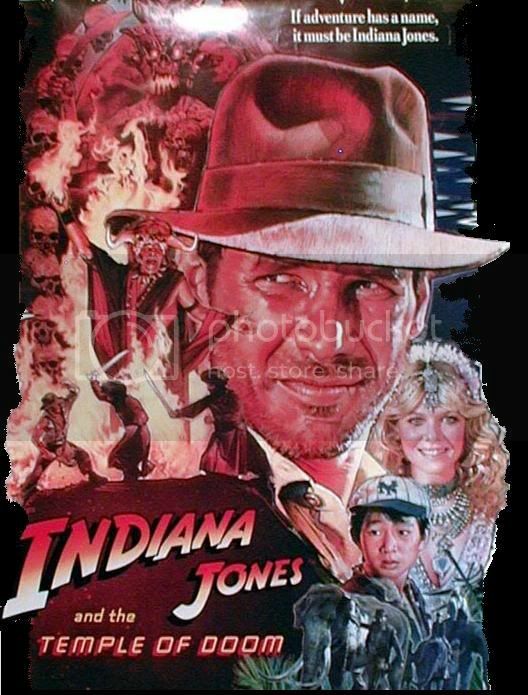 In Temple of Doom, which could be titled Indy Takes On Asia, we follow the continuing adventures of Dr. Indiana Jones (Harrison Ford, He of the Heroical Jawline), archaeologist, adventurer, stud. The story opens in China, where, after an unfortunate run-in with some Shanghai-based gangsters, Indy is almost poisoned to death, but saved by his sidekick, Short Round (Jonathan Ke Quan), and an antidote buried deep in the bosom of the blonde, vacuous Willie (Kate Capshaw, a self-proclaimed feminist - who knew!). Boarding the first plane they find, they fly off into the Himalayas, where the evil pilots parachute away, leaving them in charge of a plane without fuel. (An expensive way to kill someone, but no matter.) Indy and the gang are saved by the cunning use of an inflatable raft. A KEY SCENE for worshipers of Harrison Ford's body. For the love of Harrison Ford, LOOK at that arm! That jawline! After careening down the Himalayas, they flop into a river (the Ganges?!) and are swept into a poor, starving village. The despairing villagers inform Indy that one of their Shiva lingam stones has been stolen by the dastardly residents of the nearby Pankot Palace. Indy et al. assure the villagers that they will get their lingam back. After meeting the bespectacled, Anglicized "Prime Minister" of Pankot (Roshan Seth... who else? ), eating monkey brains, beetle bums and snake-filled-with-snakes, the gang gets lost in the labyrinthine palace cellars. There, they witness a thundering, blood-smeared Kali worship session, complete with human sacrifice and Amrish Puri (yay!) in a feathered headdress. They also witness child slavery, and this is clearly not gonna fly. So after a very, very long and violent denouement, Indy gets the lingam back, curses Amrish Puri in his own Hindi ("Tum vishwas karte ho!" Harrison seethes, again and again), frees the children and manages to boost the village's agricultural yields in the meantime! Who needs the World Bank and Amnesty International when you've got Indy!? One tiny point in this film's favor on the Sensitivity Scale was the moment when Indy, Willie and Short Round are welcomed to the village. Fed some paltry curry on a banana leaf, Willie refuses because it looks gross, and Indy starts to lose his patience: "This is more than these people eat in a week. Eat it. You're offending them and embarrassing me." We've actually faced some similar situations before (minus the demonic cult bit), and it's actually a nice little moment showing the inadvertent offensive behavior people can have, especially in places of poverty. But that moment of enlightenment feels more like an accident than anything intentional. When we go to India, we want (1) to have Roshan Seth greet us in spectacles with "PPCC, the eminent blogger?" and (2) chilled monkey brains for desert. So: were we really offended by Temple of Doom? Is it really so SERIOUS? Its outrageously unrealistic representation of India is about as outrageously unrealistic (and in the same, zany, mish-mash aesthetic!) as the representations of the British in masala films like Mard or Kranti. A key difference is that, with confident and optimistic American-centric machismo, Indy just wants to help these poor north Indian folk... speaking not-Hindi... in a palm-treed village... by the Himalayas. That - this fuzzy feeling of wanting to help people - is already a lot more palatable for the PPCC than the underlying anger of Mard and Kranti, which uses the real historical problem of colonialism to make a film filled with racist violence and mutual ridicule. Of course, silly, racist Hollywood films and silly, racist Hindi films will probably have different tones (optimistic vs. pessimistic racism?) given the different historical contexts. Or are we being silly and racist?! After all this talk, we weren't really personally offended by Temple of Doom. We knew what we were getting into. Because not only is it ignorant and, well, stupid, but it's also just bad. It does itself damage by the ridiculousness of its premise and presentation - over-the-top even for Indy! - and we're pretty confident that anyone of average intelligence who is older than 12 will recognize that you can't get your ideas about the world from the Indiana Jones series. Trying to apply logic or subtlety to Indy is like trying to make cheese ice cream: it's just not gonna happen! It won't work! What's more important is: does the stupidity and racism of Temple of Doom have possibly damaging consequences in real-life? We at the PPCC don't think so - apart from feelings of annoyance, like the caricatures of Americans in Karan Johar films - we trust in people to know that Indy is not really a good guide to the world. Are we too optimistic? Are we too optimistic because we're white? 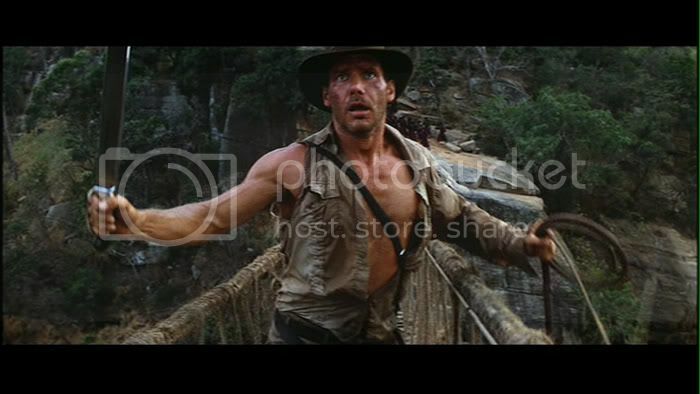 Do we sound like Harrison Ford when he speaks Hindi ("Row-kow!" he tells people when he wants them to stop)? We'll let the reader लोग decide. I actually Lol'd off my seat! I thought this was the crappy Indy movie, but as a silly kid besotted with Indian things at one time, I went gaga that Indy would go to India, missing all this stupidity and ignorance and just plain sillyness! But rewatching it just felt so eye-rollingly annoying and made me feel pie-induced to throw one at Willie coz she's sooo idiotic! But hell i loved Roshan, i think the masala pradesh in my town should annoint him "Greeter of new masala-izens" but Amrish rocked! I remember liking this film despite the obvious over the topness. This is not the type of film that makes me question moralities or other issues. I was entertained and of course annoyed by Willie but I guess that was supposed to be my reaction. I get your reverse racism point but don't see the difference. Both sides wants to make money by playing on the pride of their viewers. Re Temple of Doom, the first time I saw it, I think I was in eight grade and I remember finding the whole thing tremendously funny: "Chilled Monkey Brains? Oh those hilarious Americans and their lack of research!" The second time I saw it, I was in college and I wasn't nearly so amused: "SERIOUSLY? No, seriously? EYEBALL SOUP? Who thought this was funny?" I almost feel offended for Indy, cause he definitely deserves a better movie than this one. Maybe the reason this movie (or specifically, the dinner menue therein) really rubs me the wrong way is that it's not even REMOTELY Indian. It just seems to be a deliberate attempt to *further* Other-ize the Indian/Antagonist; "Forget the fact that their clothes are funny, and that they may not worship the same God(s) we do and that they speak English funny... just LOOK at what they EAT!" Of course, *most* people know better than to base their knowledge of world cultures on this movie... but I might point out that even in this day and age, people still ask whether we ride elephants every day in India. PS - When are you going to review Tashan? Rum - OMG yes, Willie is horrible. Everyone hated Willie, including Kate Capshaw apparently! YES, Roshan must be the meet & greet guy at Masala Pradesh. Then, when we try to leave, he can say, "Row-kow!!!" eliza bennet - Very good points, and I agree that I think this film is so ridiculously OTT that it doesn't merit much concern. I think the different racisms point I was trying (and failing) to articulate is that India has been historically disempowered (i.e. as a colonizee), whereas the USA hasn't (i.e. as a global superpower), and this leads to different types of racism (e.g. American Orientalism, I think, is different than British Orientalism given postcolonialism and has a lot of "we can save the world!" optimism in it). Harrison Ford! Oh, Harrison Ford, he deserves a song. In PPCC Pradesh, Han Solo > Indy, always. Sharon - Thanks for the comment! I can understand your annoyance; misrepresentations of Italian culture in Hollywood are a sore spot for me - they drive me up the wall. ANIL! Fear not, love for Anil never dies. I decided to leave him alone for a while since I was suffering from severe Slumdog saturation. A review of Tashan - with special note of the manboobs - is forthcoming, as is a review of an old Madz/Anil starrer, Hifazat. This movie is so very bad! Truly abysmal in every way. Off-topic somewhat, I yesterday picked up the newest copy of Filmfare here in India with Bipasha Basu on the cover and a whole page devoted to my friend the ppcc inside! Those two deletes are me. My typing was so bad I couldn't let it stand. Sorry! 1. I remember when I was leeeettle in the 70s, all the moms liked Han Solo better than Luke Skywalker, which I never understood. But NOW I understand. 2. I think in its better moments, any Indiana Jones movie approaches masala (in a good way). 3. All the Indiana Jones movies are cartoons - like you said about East Is East, the people in them are caricatures, so the projects are cartoons. And I've never had the impression the filmmakers meant them to be anything else. Which does not excuse their outrageousness, but they're pretty consistently silly. All the characters I can think of across all four films are caricatures: Kate Blanchett's evil Russian, all the super-evil Germans, the morally corrupt Frenchman, the eternal life-grubbing American businessman, the bumbling professors, the alien-worshiping South American natives, etc. I gather that's what matinee films of yore do (but I could be wrong). 4. Indiana Jones himself is an outrageous caricature of a American stereotype (that is, a stereotype about Americans, whether made by Americans or not) that I find myself having an increasingly complicated relationship with: the cowboy/astronaut righter of wrongs. As you say, he's a generally helpful sort, at least. And rugged, swaggering, arrogant, basically good-hearted, blunt, good with random weapons/tools, improvising, don't-fence-me-in, tending towards fewer words than more. But in this case, he's also an intellectual, an interesting twist. I count Torchwood's Captain Jack in this same type (and I find IJ much more attractive than CJ because he's less smug - which I blame on CJ being written by Brits, who enjoy playing with national stereotypes as much as anybody else). 5. I haven't re-watched this one as an adult, but I suspect your comparisons to Mard and its ilk are quite apt, and I bet we could find crammed-to-the-gills all-but-cartoons from many cinema cultures that behave the same ways towards their historical enemies and/or their own senses of "other." 6. Le sigh. Humans and our need to draw people as "other."